I’ve never had two brides who wanted to shop together for their dresses without being related, but in Austin, best friends Tina and Emily came to do just that. My first concern was the inevitability of each of them comparing themselves to the other. And with both brides wanting a lace dress, this was definitely going to be twice the challenge. 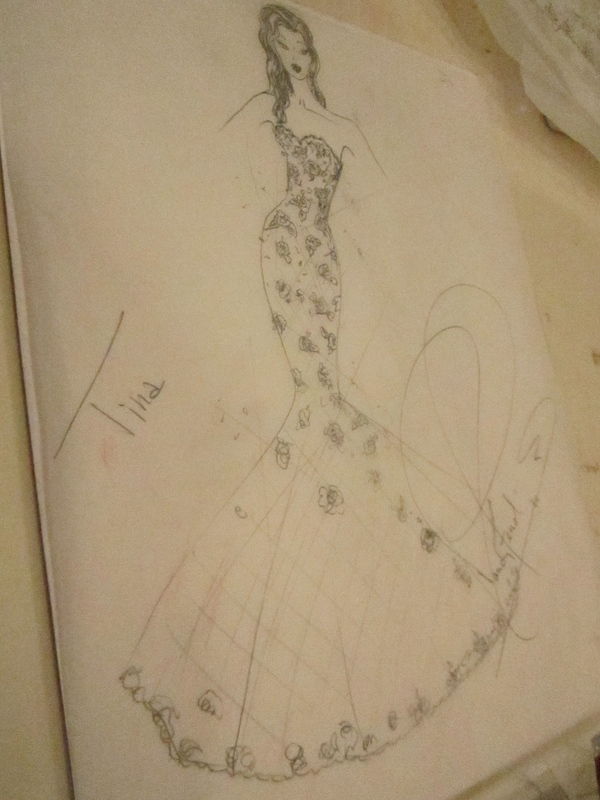 Tina wanted a dress that would make her look and feel beautiful and that “didn’t wear her”. I started by pulling gowns that would show off Tina’s curves. The first dress felt a little too “Star Trek” for Tina. 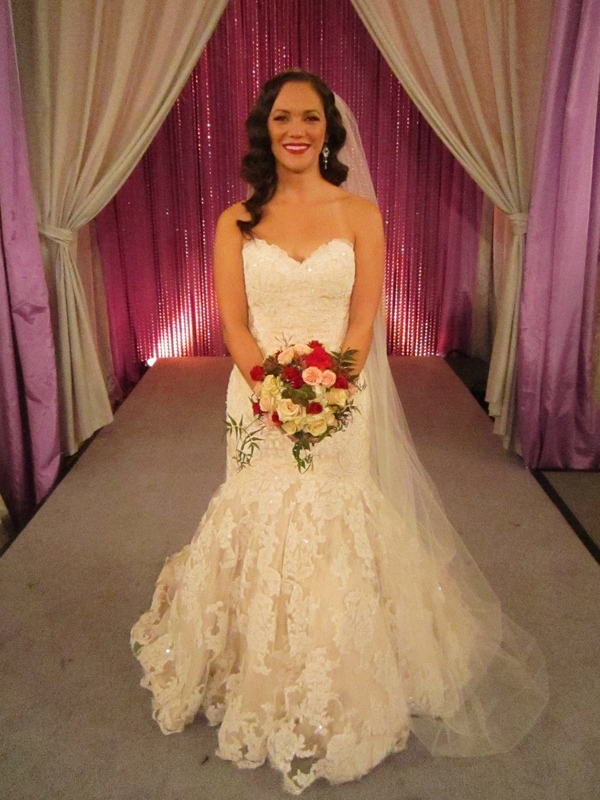 With the second gown, we found the perfect silhouette to show off Tina’s curves. Keeping with the same silhouette, I chose this mermaid gown by Venus. 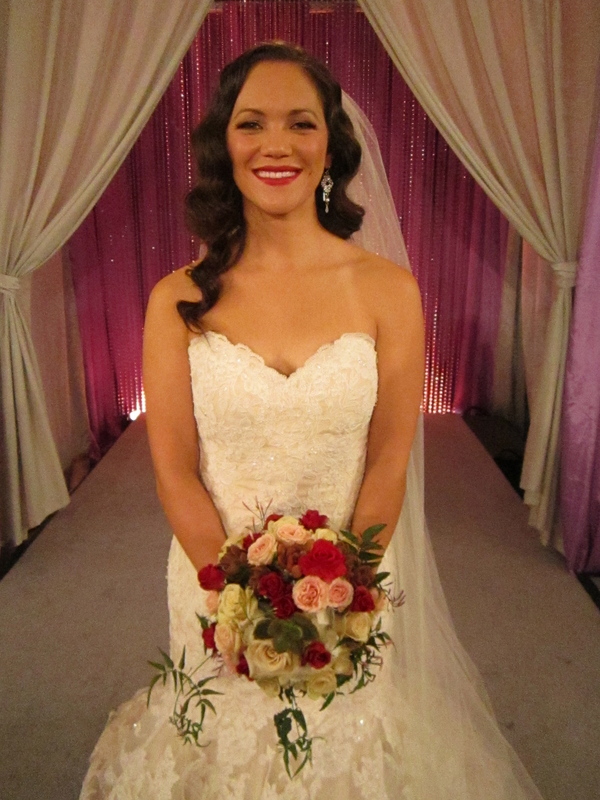 The combination of lace and sparkle was the perfect mix for Tina’s wedding and after saying “Yes” to the dress, Tina was taken to hair and makeup experts Lindsay and Raychel to complete her “head to hem” makeover. 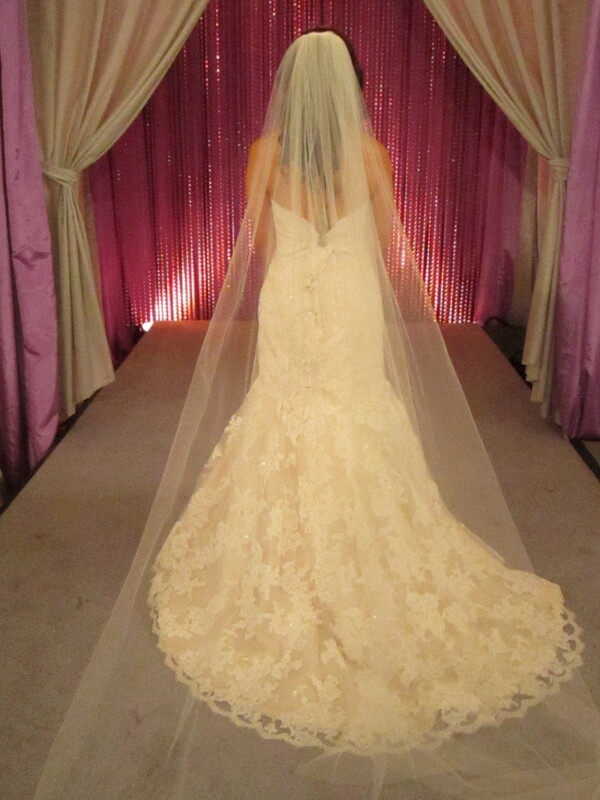 This simple 3X3 veil by Toni Federici allowed the beautiful lace of the gown to show through. Raychel played up Tina’s beautiful skin and used a bold red on the lips to add drama. Tina’s long hair was left down and styled in soft waves. 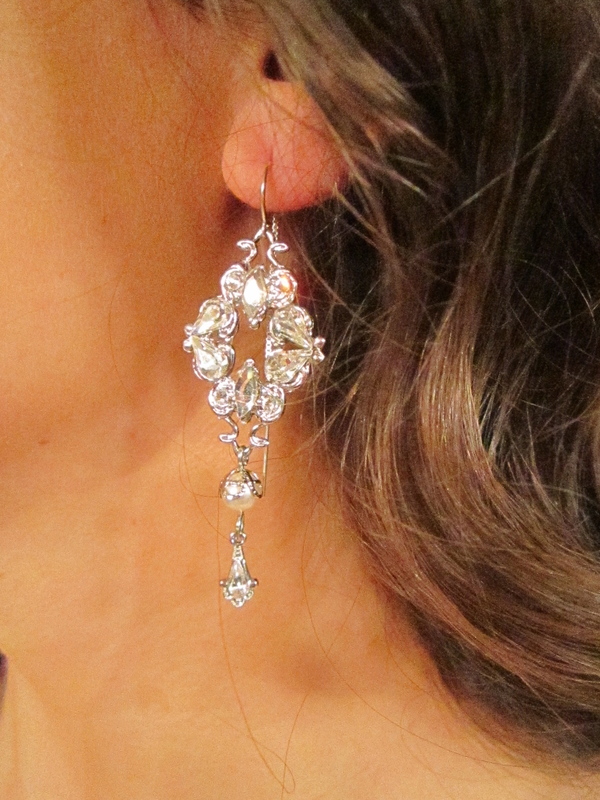 Crystal and pearl earrings (Rue) by Thomas Knoell played off the sparkling gown. 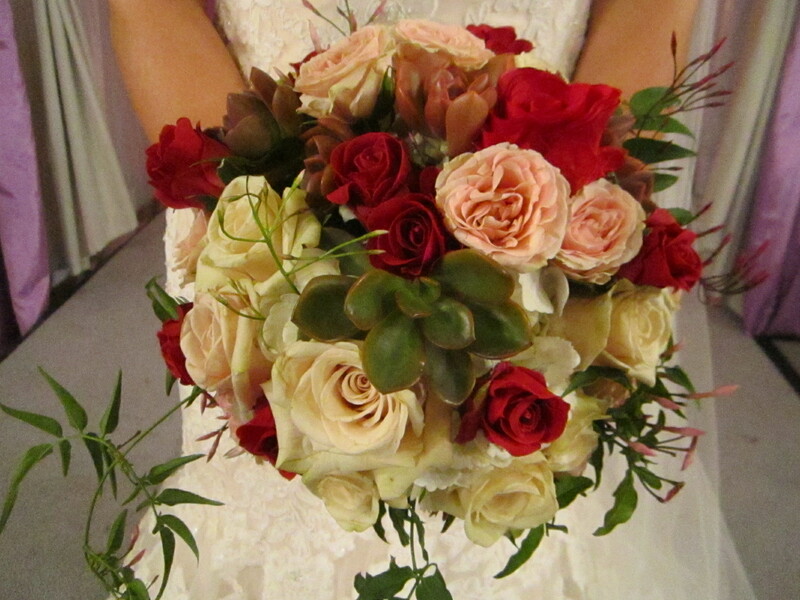 The bouquet of multi colored flowers in shades of creams and pinks also included pops of the red that Raychel used on Tina’s lips. For where to purchase Venus bridal gowns, or to view more from the collection go to www.venusbridal.com. Visit www.headpieces.com to view more accessories and veils from Toni Federici. For more jewelry from Thomas Knoell, visit his website at www.thomasknoell.com.